To the English, they’re “penny buns.” French speakers know them as cèpes, Germans say steinpilz. 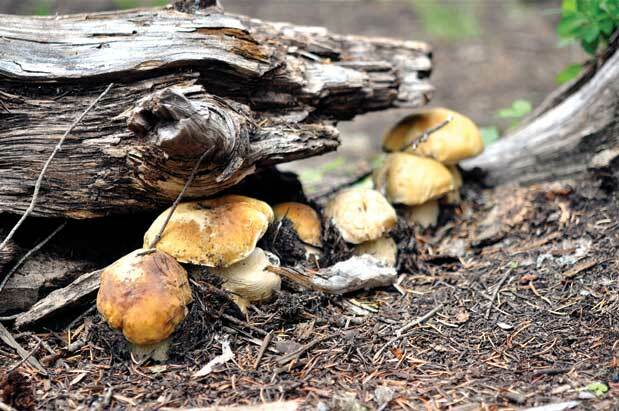 Here, in mushroom-hunting circles, we commonly call them kings, short for king boletes. On restaurant menus you’re more apt to see the Italian word for them, porcini (meaning “little pigs”), since this is the term of commerce for this mushroom in much of the world. No matter where or in what language, these proud mushrooms are a sought-after taste of the woods around the globe. Boletes have pores rather than gills, making them readily identifiable as a group. Besides being the most prized of all the boletes, the king is also one of the easiest to recognize. Look for a fairly large (sometimes several inches across the cap), tannish mushroom that resembles a hamburger bun at maturity with cream-colored to yellowish pores underneath the cap and a thick stem. When sliced open, a king bolete will be pure white inside (Russians call it beliy grib, literally “white mushroom”), and its flesh won’t stain when cut, unlike some of its kin. As with all wild mushrooms, it’s best to learn firsthand how to identify it with the assistance of an experienced hunter. The king is a meaty mushroom, with a nutty flavor when cooked fresh and an especially pungent, earthy aroma when dried. It’s fairly common across much of the West, including in our region, where it associates with conifers from the coast to the mountains. The ideal specimen will have just emerged from the forest duff, its flesh firm and hopefully bug-free. Insects, elk and bears all adore kings as much as we do, so competition in the woods can be fierce! When you get your prize home, try dicing the mushrooms and caramelizing them in a pan with a little butter. This allows the beefy texture and sweet, nutty flavor to shine. You can spread this on a sliced baguette or slather across a steak; or add more butter, some chicken stock, and toss with pasta and chopped parsley to create a simple, rustic dish typical of northern Italy, a recipe I learned from the chef at Spinasse in Seattle. Speaking of which, Italians have another name for their cherished porcini. They call it “poor man’s steak.” When you see the prices paid for kings at the market, sometimes $40 or more per pound, you might be inclined to disagree—all the more reason to find your own. » Sauté cubed porcini over medium heat in 1 tablespoon of olive oil until caramelized. Remove from pan. » Sauté onion and garlic in 1 tablespoon of olive oil until soft. Return porcini to pan and stir together. Deglaze with white wine, cooking until nearly evaporated. » Add chicken stock, a few splashes at a time, allowing sauce to cook down before adding more liquid. Adjust for seasoning. » Just before pasta is ready, add 2 tablespoons of butter to sauce. Toss pasta with sauce and parsley.